By Thibault Herpin, International Marketing & Business Development at Ecommerce Nation. Influencer marketing is a type of marketing that involves an ambassador. In contrary to celebrity marketing, the brand puts a “regular” person in the position of influence. This person has an active and large following on social media. Plus, he or she is able to create an identity for him or herself, and is therefore inspiring his/her community. Opting for an influencer marketing is a good way for companies to communicate on their product lines and their brand image. This method is a less aggressive way to promote your products than using celebrity advertisement. Influencer marketing campaigns offer a more natural way of promoting your brand. The solution is, of course, also cheaper than choosing a star ambassador to represent your products and your brand. In order to get a better understanding of this phenomenon, Reech and E-Commerce Nation have executed a survey. 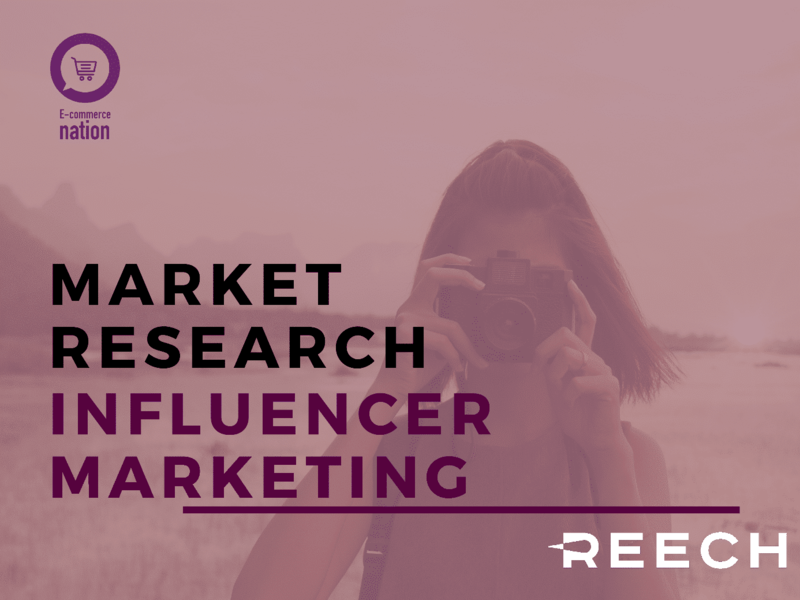 This research lead us to approach companies (North American companies in majority) and get to know more about their habits regarding influencer marketing. The most represented sector of activity went to those who work in shoppers & online retail marketing. More than 50 percent of the individuals who participated work in a marketing or related field. Half of the respondents had used influencer marketing at the time of the survey. A third of these respondents were planning on using in near future, showing that this phenomenon is growing in popularity. 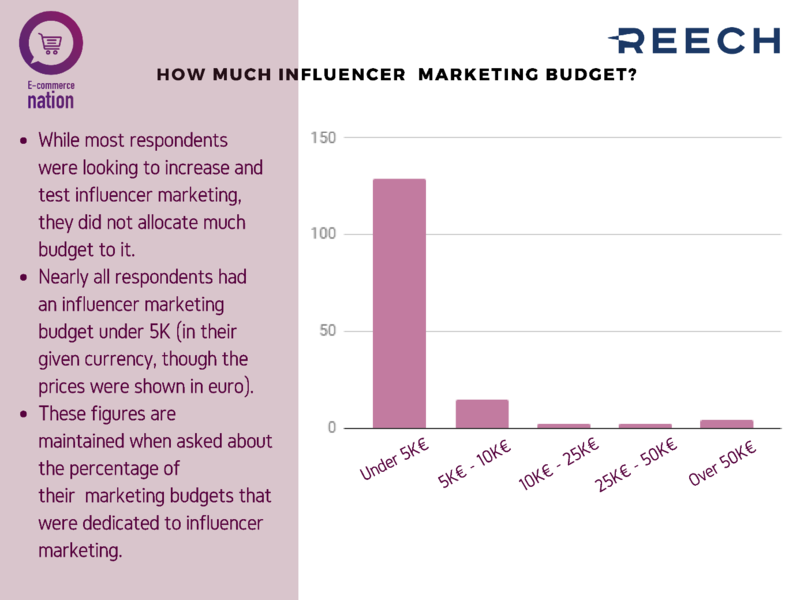 When asked about the current influencer marketing budget allocation, differences started to show. 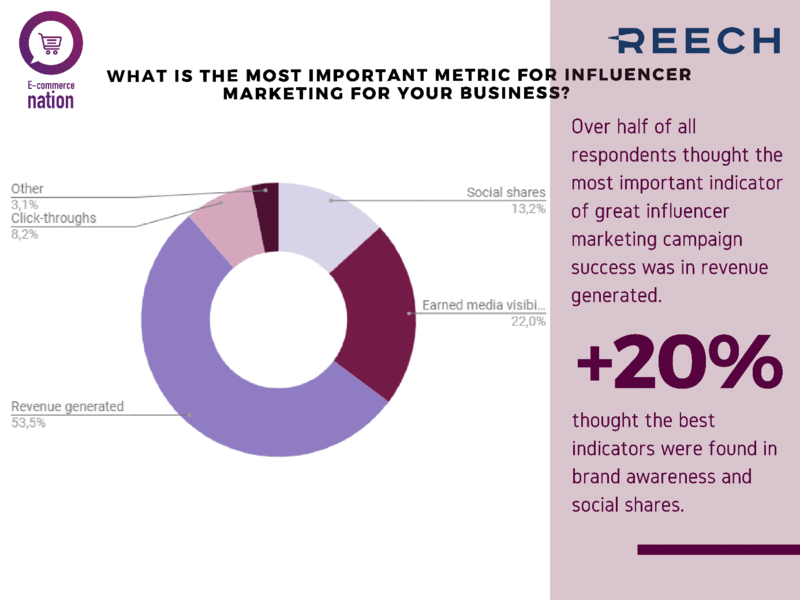 A large part of the respondents stated that they allocated between 5 and 20 percent of their marketing budget on influencer marketing. 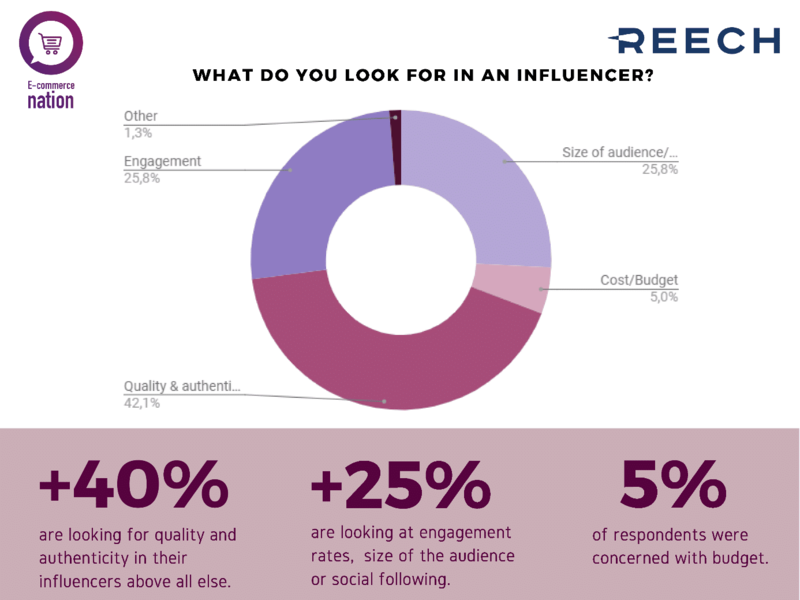 The respondents who spend between 30 and +40 percent of their budget on influencer marketing are those who spend less than 5 000€. The more budget is allocated to influencer marketing, the more people companies are able to reach with this type of communication. 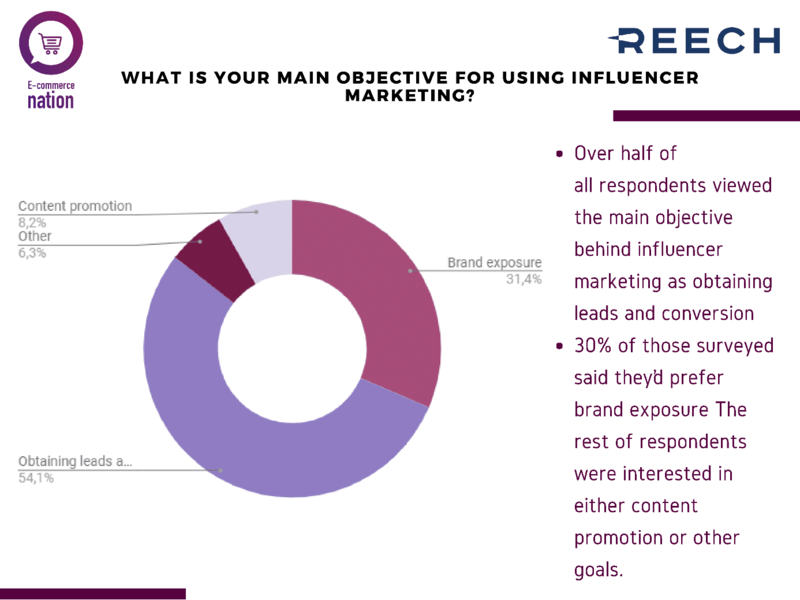 However, most of the respondents were looking to increase their overall budgets to launch influencer marketing campaigns, showing a growth of their interest in this new way of promoting brands and products. This interest demonstrates that companies are aware of the method’s pros regarding effective promotion. Every communication campaign has its goals. Companies have to define their objectives and the possible outcomes before they launch their campaigns. First of all, companies have to determine their target audience, allowing marketing departments to quantify the potential reach, choose an appropriate influencer and set up a budget. More than half of the respondents use influencer marketing to obtain leads and conversion. This method allows them to measure the impact of their campaigns and follow their conversion rate evolution. Indeed, influencer marketing allows companies to practice corporate or product communication on predetermined groups of people, permitting them to obtain leads and increase their conversion rate. About 30 percent of the respondents stated that they used or would use influencer marketing to gain more exposure. That way, companies can convey their brand image through social media and touch different or targeted communities. Then, if a company is well exposed, it can introduce its products or promotions to a larger prospect base, possibly increasing its sales. The rest of the panel uses influencer marketing to practise content promotion or try to reach other goals. Content promotion through this kind of marketing is a little bit more aggressive than simply applying corporate communication because it seems less natural. This method is still an effective way to promote your products and potentially increase your sales. Overall, influencer marketing allows companies to gain more exposure, permitting them to practice corporate or product communication on a large base of prospects. Most of the companies value the success of their communication campaigns by looking at the generated income. Over half of our respondents tend to agree with this way of thinking. For them, it is the best way to quantify the outcomes of a campaign. A fifth of the professionals we questioned view these campaigns with a qualitative eye. They think that the campaign is successful if the media start to allocate visibility to the brand or the product. If this happens, the company will be able to promote its brand, the conversion rate will evolve, leading to the logical increase of their income. Finally, almost a quarter of the interviewed people consider the effectiveness of their campaign thanks to social shares, click-throughs and other follow-up indicators such as comments and likes. The chosen influencer is going to be the brand ambassador. This person needs to share the same values as you and your company portray. This way, the influencer and your product will be suitable, giving an uprightness feeling to the influencer’s community. When they launch communication campaigns, companies have an exact idea of what they are looking for. This applies as much to the results than to the way of communication. When talking about influencers, companies tend to look for quality and authenticity. These two traits also indicate that the future ambassador produces quality content which will be appreciated by his / her following. With an authentic influencer, the brand benefits from the image of the person and the community. Marketing departments have to give goals to the content creators (audience targeting, budget, messages). Like that the company and the influencer are able to create and maintain a trust bound and a fruitful collaboration. 25 percent of the companies look for engagement and 25 percent are interested in the size of the audience. These two characteristics allow them to quantify the potential impact of the influencer and the campaign. Lastly, 5 percent of the interviewed professionals stated that they were primarily looking at the cost of the campaign. Finding influencers is a hard task. Companies must find the right person, who is leading the right community, to communicate about the right product. Plus, companies don’t have the same objectives or budgets. These characteristics have to be taken into account to find the right influencer. 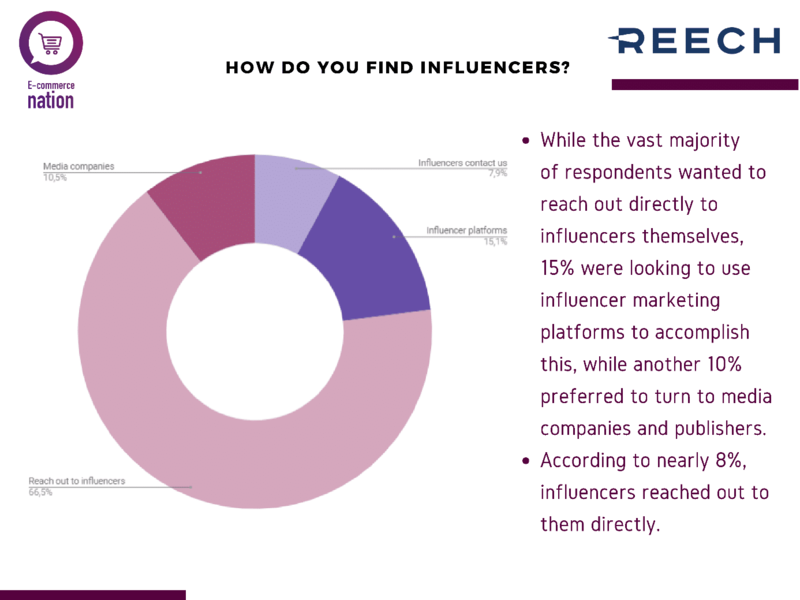 Either way, the majority of our respondents chose to directly reach out to the influencers. That method includes presenting the objectives of the campaign to the influencer, approaching financial questions, talking about the potential reach, etc. This method also enables the company to cut down costs. However, like in every action, a possible risk exists. If the marketing professional in charge of finding the influencer doesn’t choose the right person, customers will feel that the product is out of place and the campaign will lose its natural tone. 15 percent of the companies reach out to influencer platforms, while 10 percent check media companies. These professionals prefer dealing with an intermediary between them and the potential ambassador. Community-like platforms rank their influencers by theme to help companies finding the right one. Experts are also present on these platforms to advise and help companies in their pick of the right influencer or the right campaign. The last 8 percent of the companies get contacted directly by influencers, indicating that they already are popular or that they sell niche products. Among all the ways of communication, choosing an influencer is an effective alternative to promote your company’s brand or products. Corporate or product communication is achieved by the person of your choice, on the media both of you determined. This new method of communication is currently knowing a growth. Companies are starting to use it more and more with the aim of reaching a maximum of prospects who are the target of products’ promotion. 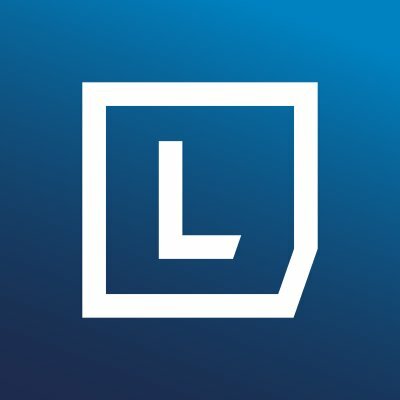 The effectiveness of this technique makes companies allocate more budget to this method in their marketing spendings.